You need to keep in mind a couple of very important terms as you read about the various tools and commands with which you make selections. Both feathering and anti-aliasing make the edges of your selections softer by using partially transparent or differently colored pixels. That, in turn, helps blend whatever you're doing to that selection into the rest of the image. 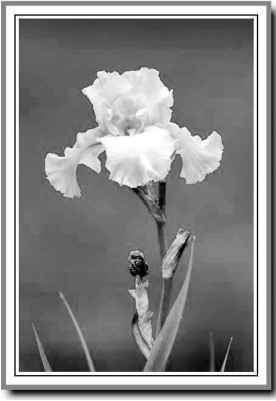 Nothing illustrates the power of feathering quite like a simple black-on-white demonstration, as you see in Figure 8-4. In the upper-left, I made an unfeath-ered selection and filled it with black. To the upper-right, the filled selection is exactly the same size but has a 2-pixel feather. Below, I used a 15-pixel feather when making the selection. Figure 8-4: A close-up look at no feathering, feathering, and lots of feathering. Note that there's feathering on both sides of the selection border. And don't be fooled by the amount that you enter in the Feather field on the Options bar — that's a general guideline, not a precise value. A 15-pixel feather for the Elliptical Marquee tool might give you 50 or 60 partially transparent pixels, half on either side of the selection border. Even a 1-pixel feather gives you a selection with several "soft" pixels on either side. Anti-aliasing is similar to feathering in that it softens edges: It's designed to hide the corners of pixels along curves and in diagonal lines. You use anti-aliasing with type (as I explain in Chapter 13). You'll often find that anti-aliasing is all you need to keep the edges of your selections pretty; feathering isn't required. Antialiasing is a yes/no option, with no numeric field to worry about. Figure 8-5 compares a diagonal with no antialiasing, with anti-aliasing, and with a 1-pixel feather. Figure 8-5: Anti-aliasing helps smooth the appearance of curves and diagonals. At 100 percent zoom (to the upper left), the first line looks bumpy along the edges (has a case of the jaggies). The lower line looks soft and mushy, out of focus. And the middle line? To quote Goldilocks, "It's just right!" When zoomed to 600%, you can really see those jaggies and that softening. And in the middle, you see that the anti-aliasing uses light gray and mid-gray pixels interspersed along the edge among the black pixels. At 100% zoom (upper-left), your eye is fooled into seeing a straight black edge. 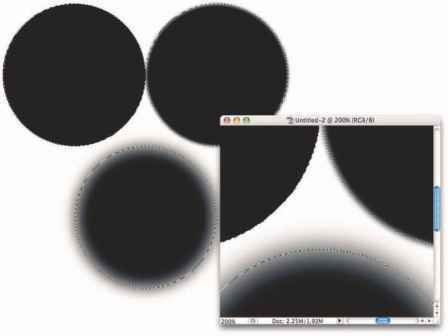 Generally speaking, use anti-aliasing with just about every selection (other than rectangular or square), and use feathering when you want to really soften the edges to create a special effect.